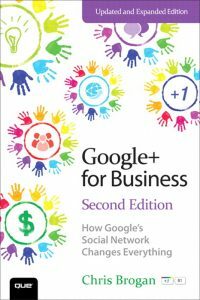 Google+ is an important social network to consider for your business (be that a small business or a large one) because it’s run by the same company that controls the largest search engine in the world, and because that same search engine is looking anxiously at social networks and social signals to better understand how humans share information like links, so that they can even better predict what people want to see when asking about this or that. Said another way: this social network might possibly be much more important for your business interactions than Facebook or Twitter, and definitely more so than LinkedIn, if for that reason alone. Every week, millions more people sign up for Google+: Suddenly, it’s today’s hottest new social network. Google+ for Business reveals why Google+ offers business opportunities available nowhere else–and helps you grab those opportunities now, before your competitors do. Top social media professional speaker and business advisor Chris Brogan shows how to get great results fast, without wasting time–and without wasting a dime. Brogan guides you through using Google+ for promotion, customer service, community building, referrals, collaboration, and a whole lot more. You won’t just master innovative new tools like Circles and Hangouts: You’ll use them to generate more customers and more cash!